"My" Harry had protected the Sorcerer's Stone at the price of one's life! Then the first year of us, Harry and I, at Hogwarts has finished at last. Thanks Harry, and see you next year! I had read over one million words of a-lot-of-reading in this book! I'm in the fullness of my heart now. Oh, sorry. I've totally forgotten to leave a message here to cerebrate your well-done work! Even though I had thought I said something...silly me! Anyway, congratulations on your great job! 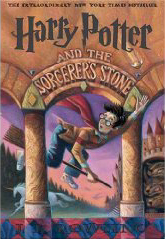 I did enjoy reading the same story of HP with you and I hope we can share any ideas of HP in the future again. Actually, I've ordered 2 more HP PBs and I'll probably get them tonight! That's no problem and I'm also so sorry I wasn't able to reply to your comment for few days. Thanks once again, for your congratulations! Wow! You got new HP books at last! Well... I'm going to face a thorny path, I think, but I'll do my best.